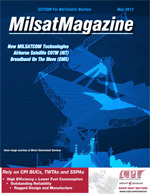 PointOfView: DoD + SATCOM, by Kay Sears, President, Intelsat General Corp. Successful communication network design, whether terrestrial, satellite, static or Communications-On-The-Move (COTM), is successful only when user applications and requirements are fully understood. Satcom-On-The-Move (SOTM) offers true broadband communications capabilities for civil and military users. While the ultimate desire is to use satellite Earth stations, which are as small and light as possible, several trade-offs affect the ultimate coverage areas and communications data rates these systems can provide. This article considers several of the factors that drive the selection of a specific SOTM Earth terminal configuration. Continuing its ongoing efforts to facilitate open dialogue between government and industry, the Hosted Payload Alliance produced the Hosted Payload Key Issues Workshop on Monday, April 8, 2013 at the Broadmoor Hotel in Colorado Springs in conjunction, with the National Space Symposium. Innovation is amazing. Frequently, innovation creates evolutionary change in industries and technologies in the form of minor improvements, cost reductions and increased quality. Broadband-On-The-Move Satellites Take The Pole Position, by Dr. Rowan Gilmore Managing Director, EM Solutions Pty Ltd.
Defence forces, first responders, and emergency services and disaster recovery personnel all require reliable and trusted communications to operate in theaters in which infrastructure must often be transported. Backhaul of traffic from multiple devicesphones, cameras, computers, and equipment control systemsto a remote headquarters has, perhaps, become simpler and more integrated with IP-enabled devices and localized Wi-Fi. Working with the NATO Consultation, Command and Control Agency, Globecomm equipped the troops of the International Security Assistance Force in Afghanistan with rugged, suitcase-size units providing Blue Force tracking and texting service that saved lives and helped pierce the fog of war. Congratulations to the Space Foundation for pulling off a highly productive and enjoyable National Space Symposium (NSS) in spite of the challenges of sequestration. Military attendance at the 29th annual NSS was certainly far below normal levels and NASA was totally absent, but the event easily shifted to a most worthwhile industry-to-industry focused networking opportunity. The face of the Space Symposium has changed. I think those of you who joined us here in Colorado Springs would agree. We still had lots of U.S. Air Force generals on the agenda and strong support from U.S. Army space warfighters. But this year, the face of the Space Symposium was increasingly international... on the program stage, in the exhibit center, and in the private meetings. Arguably, during no time in the history of the U.S. military has the issue of cost consideration been as critical as it is now. Advertiser Index, Please click on our advertising sponsors to be directed to the story in which their message and Web site link appear.